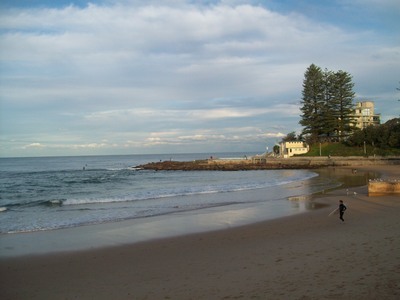 Dee Why Beach is located on Sydney's northern beaches – between Collaroy to the north and Curl Curl to the south. The beach promenade and facilities have had a major upgrade over the past 18 months and as a result Dee Why Beach has become a very popular family spot. The southern part of the beach features a great enclosed playground, with plenty of tables and seating, making it an ideal spot for families with young children. Nearby is also a rockpool with showers and toilets. Dee Why beach is a patrolled surf beach and is ideal for swimming, body surfing and surfing. Across the road from the beach are many cafes, take away shops and restaurants, including a popular fish and chips shop, pizzeria and gelato bar. On the weekends, you will often find musicians belting out their tunes and during special holidays, Dee Why beach becomes a host to many events, including Australia Day Big Breakfast on 26 January and "Music in March" free concerts being played every Sunday. Dee Why Beach has something for everyone; so pack a picnic and head down to the beach this weekend. You won't be disappointed.